You are here: Home > Media > Blog > CB40: Happy 40th birthday to child benefit! But will it last another twenty? Yesterday, the minimum wage celebrated its 20th birthday. Today, child benefit is having a 40th birthday bash. But, as this analysis shows, it’s become a somewhat modest affair, with (record) low generosity, fewer people invited than in earlier years, and particularly complicated arrangements. So today is a good time to step back and take stock of what the future might hold for this benefit. 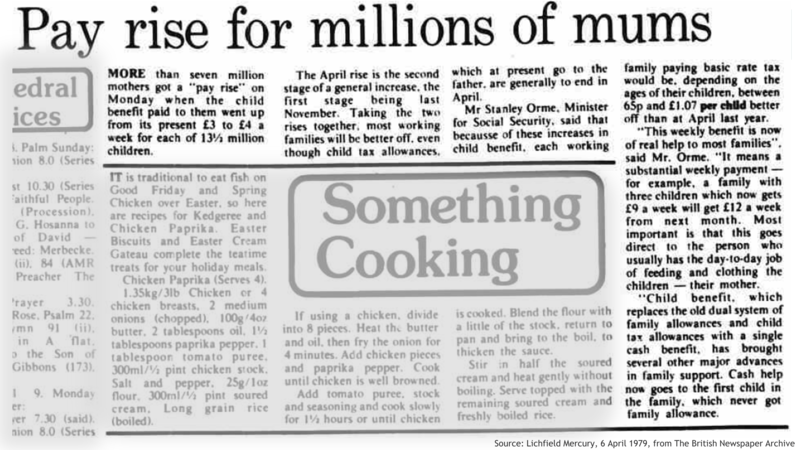 Child benefit was fully introduced on 2 April 1979, after a several year phase-in. ‘Child tax allowances’ (dating back to 1909, as well as a brief spell from 1798 to 1805) were scrapped in the same week, while the ‘family allowance’ cash payment (introduced in 1946) had been subsumed already. For the first time, every child in the UK was entitled to the same level of basic support, regardless of family size or income. Replacing a tax allowance with a cash payment also (at the time) meant money then flowed more to mothers and less to working dads. But both child benefit and its predecessors reflected the idea that the tax and/or benefit system should, in assessing need or ability to pay, account for the presence of children in a household – a simple argument that is not necessarily disagreed with at present but has perhaps been forgotten. Today, child benefit is still one of the country’s most important benefits, costing almost £12 billion a year and aiding 7 million families and 13 million children. It is currently worth £20.70 a week (£1,080 a year) for a first child and £13.70 a week (£710 a year) for subsequent children. Yet whereas it would usually rise this week to account for inflation, the benefit freeze means it will not. 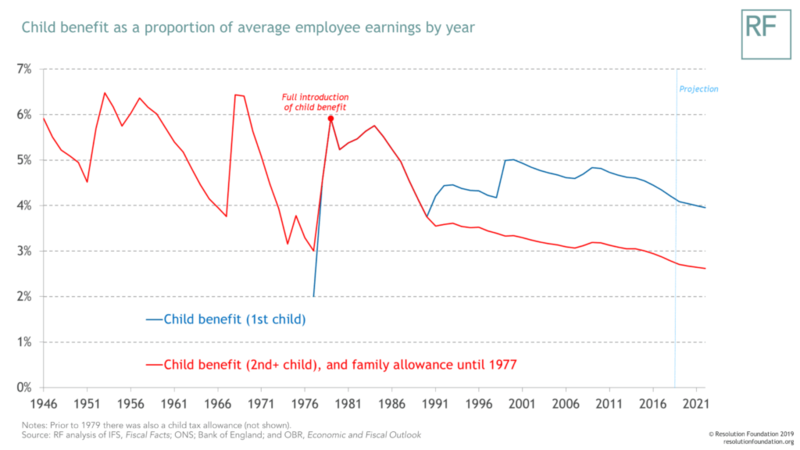 The chart below shows a history of the value of child benefit, adjusted for (CPI) inflation. Three past increases are particularly evident. In 1991, John Major introduced a higher payment for the first child, giving families around £140 a year more in today’s money. In 1999, Tony Blair raised the value of the first-child payment substantially, giving families around £220 a year more. And in 2009 there was a further boost of around £30 a year, “reinforcing the government’s commitment to child benefit as the foundation of financial support for all families”. But in the decade since 2009-10, child benefit for a first child has only been increased by 3 per cent in cash terms, whereas prices have risen by 24 per cent. So its real value has been cut by around £210 a year. A family with two kids has lost £350 a year. 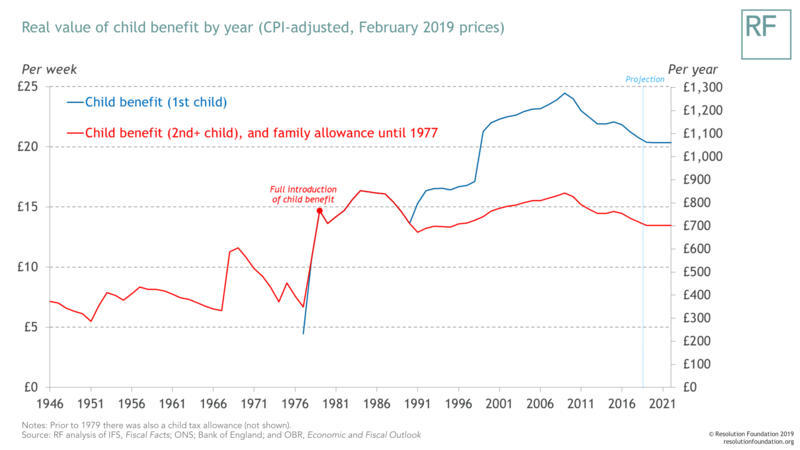 Indeed, child benefit for a second child or beyond will be worth less in 2019-20 than when it was fully introduced in 1979 – despite society being far richer today – though fractionally above where it was in the early 1990s. Compared to average earnings, child benefit for a second child will (at 2.7 per cent) be less than half as generous as it used to be (5.9 per cent), and less generous than the post-war family allowance was (also originally 5.9 per cent). For a first child the benefit is close to – though not quite at – a historic low. On the whole then, it is fair to say that child benefit is at its stingiest in forty years. If child benefit were as generous in 2019-20 as it was in 1979-80 (compared to earnings), a family with two children would (all else equal) be £1,300 a year better off today. It might be argued that child benefit has declined because means-tested tax credits have provided an alternative way to support lower-income families. But tax credits have of course faced their own heavy cuts, and are being abolished beyond a second child. There is a legitimate, timeless argument about the role of universal versus means-tested social security, but at present both are being cut. It should be noted though that child benefit is of course no longer universal. Since 2013, families in which at least one parent earns more than £60,000 have not received child benefit, and those in which either parent earns between £50,000 and £60,000 have received only a partial payment (due to the ‘High Income Child Benefit Charge’). This has saved the government around £2 billion a year, and means that around one-in-five families are no longer entitled to the full benefit (if any). But these thresholds are fixed, whereas earnings will in general keep rising each year. This is already broadening the group affected. Whereas so far only higher-rate taxpayers have been affected, it is likely that growing numbers of basic-rate taxpayers will also be affected starting in 2021-22 (when the higher-rate tax threshold is predicted to rise to around £51,000). In the longer term, the proportion of parents affected will only accelerate. The chart below illustrates how projected earnings growth would bring more people past the £50,000 and £60,000 thresholds in the 2020s. 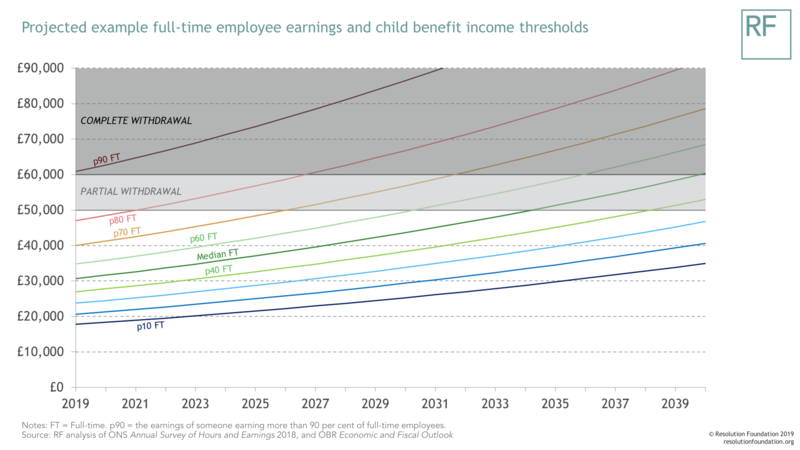 By 2040, any family containing someone in the top half of full-time pay would no longer receive child benefit. Importantly, the more child benefit becomes something only received by the poorer 50 per cent of parents, the more likely it is that it will be abolished and essentially brought into Universal Credit: there being little point in having two separate means-tested benefits for lower-income parents. Gradually, the number of people in the £50-60,000 band is also likely to increase. And one concern is that these parents face higher marginal effective tax rates due to the way their child benefit is reduced as they earn more. This currently amounts to an extra 11 per cent (i.e. losing 11p for each additional pound earned) for a parent in this income band with one child, and 32 per cent for a parent of four children. What’s more, due to the way this withdrawal works (you lose 1 per cent of your child benefit award per extra £100 earned), even if child benefit only rises in line with inflation in future, this means withdrawal rates will actually rise too. 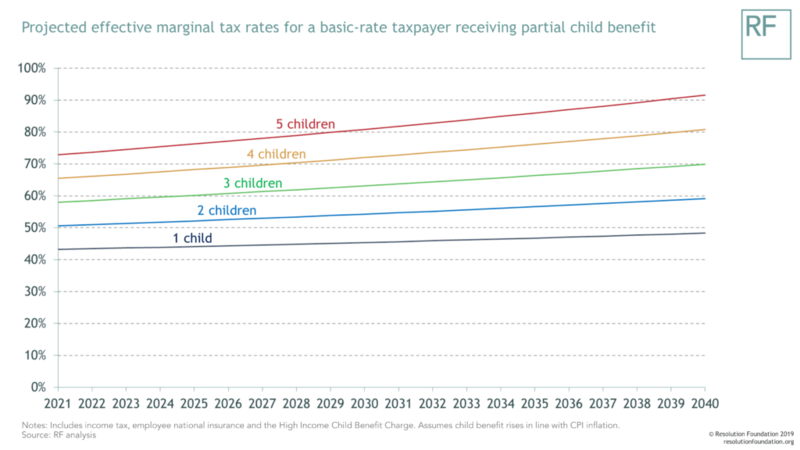 By 2039, a basic-rate taxpayer with four children, in the partial withdrawal range, would have an overall marginal tax rate of 80 per cent when combined with income tax and national insurance (or 89 per cent if also repaying a student loan). As more and more workers become ineligible for full child benefit, a withdrawal approach based on individual circumstances – rather than overall family income – becomes even more jarring. The fact that a single earner on £52,000 is affected but a couple of earners on £26,000 each are not already attracts accusations of unfairness, but will be even less justifiable if or when £52,000 becomes a fairly typical full-time salary rather than still quite a high one. This difference between child benefit’s means test and that of Universal Credit (based as it is on family income) is also likely to hasten the point at which some people are simultaneously affected by the High Income Child Benefit Charge and receiving Universal Credit. This would be somewhat absurd, as well as creating marginal tax rates of near 100 per cent. We might also care about the numbers affected by the withdrawal because of the administrative burden. This system does not work automatically. Parents must either opt-out of child benefit entirely, though this may cause problems for National Insurance records meaning some people are likely to miss out on later state pension income, or go through the tax self-assessment process. It seems likely that as more and more parents are brought into these processes, the clamour for change will grow: people do not want to have to jump through hoops in order to not receive a benefit. Despite significant cuts and the new, slightly ham-fisted, means-testing, child benefit remains an important part of the benefit policy landscape. Its straightforward approach and very high take-up mean it remains an easy way to provide more (or less) support to parents and children, as desired. 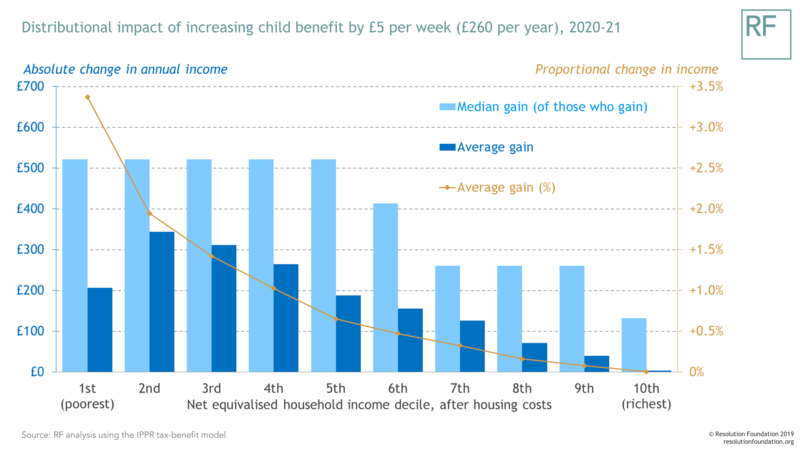 For example, the chart below shows the distributional impact of increasing child benefit by £5 per week (mirroring the Give Me Five campaign in Scotland). Despite benefiting most parents, because parents and children now typically have lower living standards than many other groups the impact is distinctly progressive: reducing inequality and cutting the number of children in poverty by more than 100,000. Such an illustrative change would cost £2.7 billion in 2020-21 (which, for comparison, is less than Entrepreneurs’ Relief is expected to cost in that year). We have shown in previous work that cancelling the two-child limit and family element abolition, and increasing Universal Credit’s work allowances for parents, are important priorities at the moment, and would make a big difference to the outlook for child poverty. But although getting Universal Credit right is crucial for supporting parents, there remains a strong case for a universal (or near-universal) child benefit. Policymakers are now looking to be even more ambitious with the minimum wage as it enters its third decade, with a review into just how high it can go as a proportion of earnings. At present the future for child benefit looks much darker, as it plumbs record lows relative to earnings and becomes increasingly means tested. Sooner or later, a choice will need to made: rejuvenation or termination.